BHOPAL: An interesting initiative of facilitating children’s open hearted talk about issues around them at a remotely set village in Hoshangabad took the social media platform Twitter by storm on Sunday. 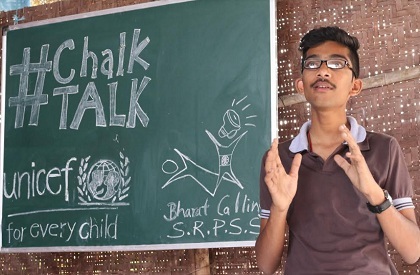 This was a unique opportunity to ‘talk’ for children at the #ChalkTalk event organized on eve of Universal Children’s Day (November 20). From Pathrota village in Hoshangabad district children spoke their heart out on the theme of sustainable development goals (SDG). This is part of project of UNICEF and Bharat Calling in Hoshangbad district. Children left elders far behind as they eloquently and easily talked about issues surrounding and bothering them. The event went live on social networking sites like You Tube, Twitter, and Facebook page with support of adults. Eight of these children shared issues they are working on like clean water, sanitation, responsible consumption and gender equality. Savita Sirsam spoke on her work on clean water and sanitation, how she used patience and conversation to talk about the issue in her area at ChalkTalk, while Mohit Bathre spoke on self learning he had during the journey of working on SDGs. Anamika spoke on the gender issue. Children spoke about the challenges they faced and how they are still showing preservance and working on it. Anil Gulati, Communication Specialist of UNICEF in Madhya Pradesh who was with children, said that ‘Chalk Talk’ was a platform for children to share their views on the efforts they are putting on issues which impact them and on the eve of world children's day, which talks of action by children for children. Sandeep Mehto, of Bharat Calling shared that we are in journey and it is work in progress, where children are exploring and learning about SDGs and taking action. Jaskaran Singh, digital strategist, who monitors social media said that this is unique, Bhopal does not trend always in social media in India, but this was from rural Madhya Pradesh, yet trended, which was fascinating to see.